The BadSeed House @ Urbavore Farm is an 800 s.f. 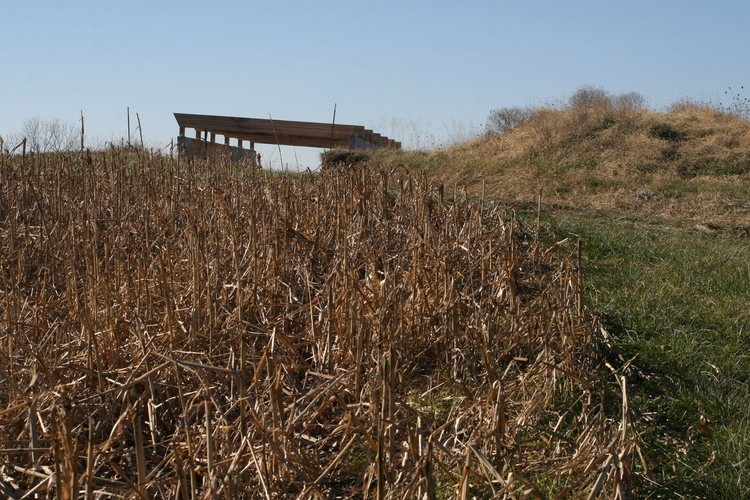 house for a family of three, submerged into the earth, on a 15 acre site. Embedded within the earth, the house utilizes passive design strategies - making it entirely self-sufficient. The project is exclusively toxin-free, and includes a greenhouse and barn. 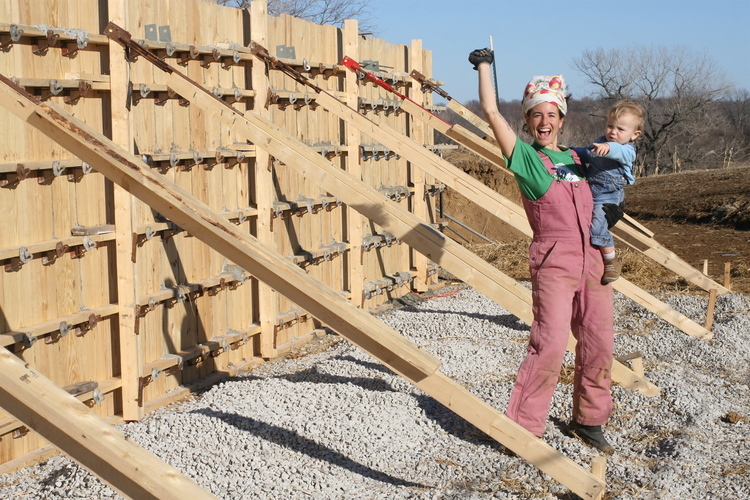 The first of its kind in Kansas City, the house is self-sufficient in power, water, and waste, and is entirely off-grid. The project is 99.9% toxin-free, and also includes a semi-attached greenhouse and detached barn. 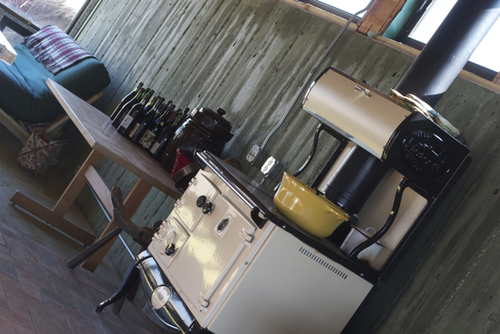 At the center of the house is the farmer’s hearth: the kitchen. Branching off from the kitchen are walls that align with sunrise and sunset on critical dates throughout the year: summer and winter solstices. Thus, during harvest season in the morning, when the farmer leaves to tend the farm, the space is directly lit, whereas in the evening the family experiences sunsets while sharing the fruits of their labor. A daylight analysis optimized the design of the shell and apertures. 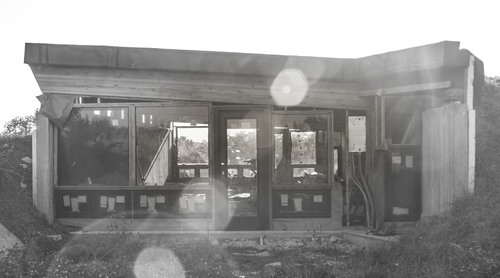 During the summer months no direct sunlight enters the house with the exception of late evening; during the winter months, between harvest season, direct sunlight enters through a clerestory to heat the concrete slab, providing warmth throughout the night. This passive design strategy helps keep the house cool during summer and warm during winter, all without the need of mechanical HVAC systems [furnace // air conditioning] - greatly reducing energy consumption and environmental load. During Summer, the east and west ends of the building open to allow for prevailing winds to cool the house. Moreover, very little direct sunlight enters the house with the exception of late evening. 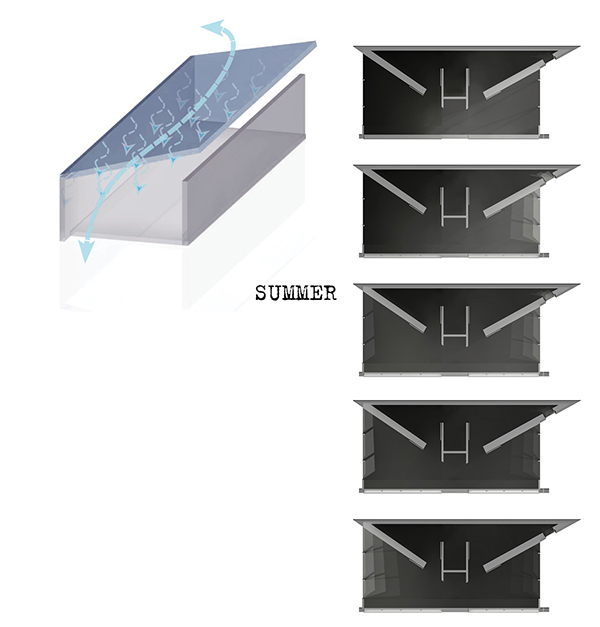 These passive design features eliminate the need for any active cooling systems. During the winter months direct sunlight enters through the clerestory to heat the concrete slab, providing warmth throughout the night via thermal mass. 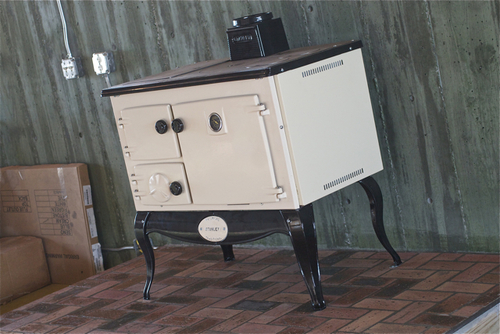 As such, only a small wood stove, also used for cooking, is required to heat the space even during the harshest winters. Architecturally programmed as space for three humans and countless other animals, insects and plants will call this plot of land home. Their coexistence is the goal of the BadSeed House. The intent of the house is not to force the surrounding land into compliance, but to be the rain that collectively flows from mountains to sea. Designed to be built by the owner with little construction experience, the house was designed for ease of erection without the need for a contractor. The Badseed House is a rectangular box within the earth. Its shell is two opposing concrete walls facing north and south, with two glass ends on either side. The roof releases its ties from the ground and breaches the earth's surface, letting light into, and views out of, the main living spaces. 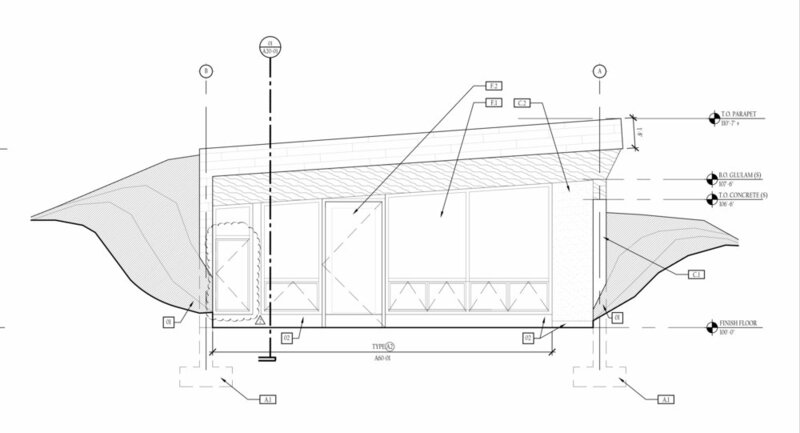 The roof of the house is supported by glulam beams and joists. 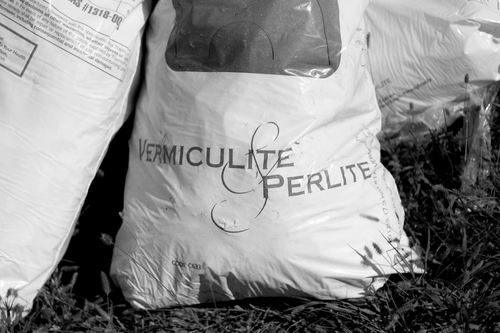 The soil is a 50-50 mix of topsoil and vermiculite, which reduces the load on the structure while encouraging the growth of low-rooted plants. In 2012 the BadSeed House won the Monsters of Design Awards from the Young Architects Forum of the Kansas City chapter of the American Institute of Architects. LIONarchitecture's BadSeed House won the award for "Best Unbuilt Project 2012". Monsters of Design is an annual design awards competition for architects and designers under the age of 40 living and working within 250 miles of the Kansas City metropolitan area. 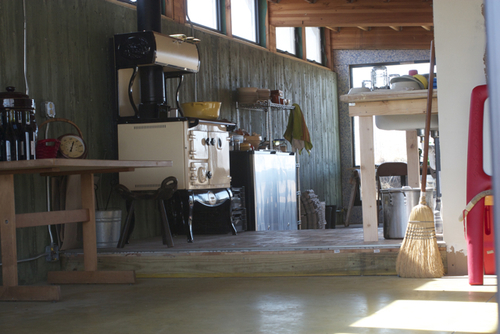 Furthermore, PBS featured the BadSeed House in a recent documentary show about urban farming. The show highlights some of the challenges of the project from its inception through completion, and covers many of its design features. In their interviews, Brooke and Dan gave an insight into day-to-day life on the farm and living in the house. Furthermore, the Kansas City Star published a video feature on the BadSeed house, describing the benefits & challenges of urban farming. 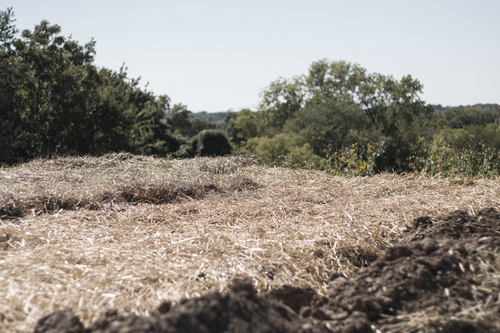 With the BadSeed house as the backdrop, the video covers why eating locally is important for the Kansas City economy, and how having a farm on what was previously unused land, the BadSeed House eased financial strain on the city for land maintenance. “In a few short days I will give birth in this home. A large tub of water will sit warm & full in the living room. As the sun sets, rises, or shines hot through the vast window walls, my child will come into this world, never knowing what went into creating this space. Day in & day out we’ve toiled intensely, maniacally, sometimes joyously, but always with such pure intent, such raw emotion, and unwavering dedication. The house sits on the highest point of our 15-acre urban property. It overlooks an apple orchard to the east and more orchards & vegetable fields to the west with a view of downtown when the sun sets & the city lights up. 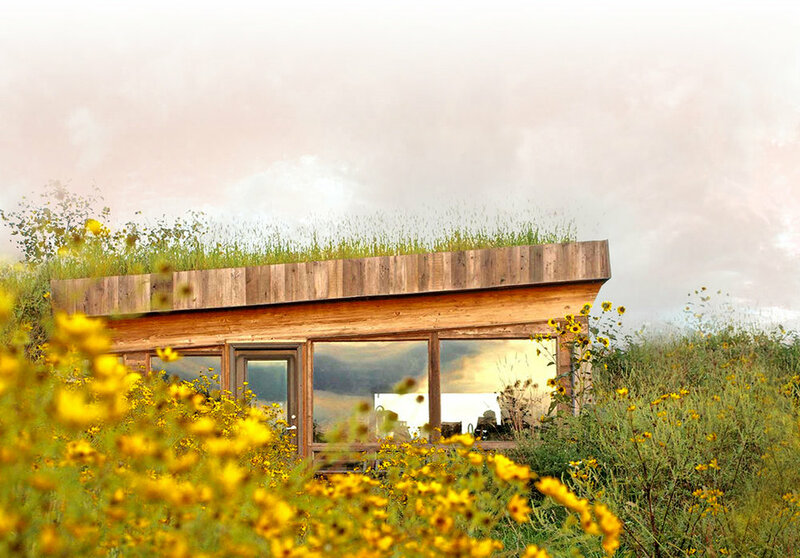 It is an unassuming, passive solar, earthbermed shelter nestled in the cool belly of the earth. The north concrete retaining wall is covered with dirt. The dirt continues over the roof which holds a foot of soil. 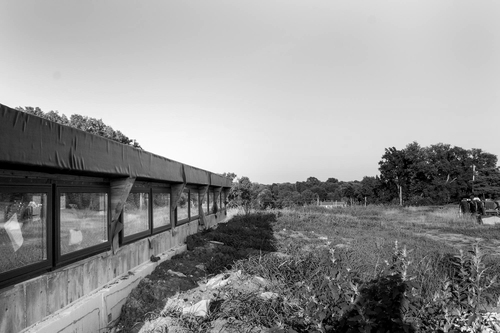 The south retaining wall is covered with dirt six feet up at which point it gives way to a stream of clerestory windows creating a “greenhouse” effect. The east and west walls are glass allowing us to see the sun rise & set. We have spent the last 6 years creating self-sufficient systems for food production, waste, water, energy, and shelter. Every penny that has paid for these systems came from the surrounding fields. No banks, no loans, no trust funds...just good old fashioned hard work (mixed with seeds, soil, and sunshine). And in regards to the house, there is so much beauty & nobility in this fine structure that’s been so thoughtfully crafted. There are certain aspects of the house that simply blow my mind every single day. First, the overwhelmingly gentle ambiance cannot be denied. The weight & honesty of the materials (and the feeling of being immersed in the earth) constantly strike you, purring safety & shelter. Due to the use of nearly 100% non-toxic materials, everything breathes in a beautiful way. The sunrises steal your heart, and the sunsets simply stop you in your tracks. All this, powered by the sun, thanks to our solar panels that sit just south of the house. No light, no pump, no electronic goes un-fueled by the rays of the sun. It’s practical, it’s functional, it makes good sense.